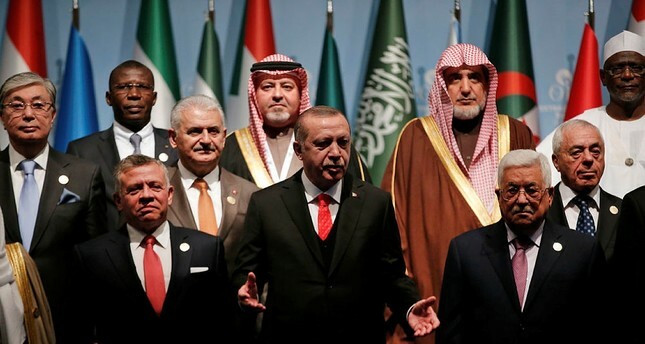 A day after the leaders of Saudi Arabia and Egypt skipped the Organization for Islamic Cooperation (OIC) meeting in Istanbul, a report emerged, claiming that Riyadh and Cairo pressured Palestine and Jordan to skip the major event on Jerusalem. David Hearst, the editor-in-chief of the Middle East Eye, said that Egyptian President Abdel Fattah el-Sisi tried to downgrade the importance of the Jerusalem conference by pressuring Abbas not to head the Palestinian delegation to Istanbul, citing "well-informed sources, who spoke on condition of anonymity." In the meantime, sources said that Jordanian King Abdullah II was summoned to Riyadh and also warned against going to Istanbul. Neither Abbas nor King Abdullah agreed with their Arab allies and headed to Turkey with their delegations, Hearst said. Abbas told the international summit that the United States was unfit to mediate the Mideast conflict, calling Trump's decision a "crime." "The United States has chosen to lose its qualification as a mediator ... We will no longer accept that it has a role in the political process," Abbas said. He suggested the U.N. should take over as mediator. Egypt remained relatively silent on Trump's Jerusalem decision. As the first Arab country to sign a peace deal with Israel in 1979, it relies heavily on $1.3 billion in U.S. military aid, and after a spell of rocky relations with Washington under Barack Obama, has no desire to antagonize Trump. Saudi Arabia, the custodian of Islam's two holiest places of Mecca and Medina, cannot be seen to remain indifferent on the fate of Jerusalem, which contains the religion's third holiest site, and decried Trump's move as "unjustified and irresponsible." Riyadh wants to see a peace deal with Israel and closer ties in the face of the shared threat from regional rival Iran, but not at any price, said Giorgio Cafiero, who heads the Washington-based risk management consultancy Gulf State Analytics. Behind the scenes, Saudi's Crown Prince Mohammed bin Salman has excellent relations with Trump's son-in-law and aide Jared Kushner, in charge of a new push to get an Israeli-Palestinian peace deal, said James Dorsey, who is a Middle East expert at the University of Wurzburg. "In this scenario Saudi Arabia would ensure Arab backing for a peace plan put forward by Mr Kushner," he wrote. Invited by Erdoğan, leaders and representatives of 57 Muslim countries gathered in Istanbul in response to last week's U.S. recognition of Jerusalem as the capital of Israel, a decision believed to be pushed by Trump. At Wednesday's conference, Muslim countries declared East Jerusalem the capital of Palestine "under occupation" and urged the U.S. to withdraw from the peace process and back down from its Jerusalem decision.